Intro Hostel v Krakov, Polsko: Zarezervujte nyní! Free of charge cancellation is possible 1 week prior to arrival date. Reservation to be prepaid 50% value to be confirmed. The rest 50% must be paid latest 1 week prior to arrival. If you're looking for a place to stay in the centre of Kraków Old Town, but you don't feel like sleeping in an expensive and boring hotel room – INTRO HOSTEL is the best choice for you! We can't guarantee a completely quiet night or birds singing outside the windows, but what you'll get for sure is a great, spontaneous experience filled with newly met friends and surrounded by the most recommendable sites of Kraków. 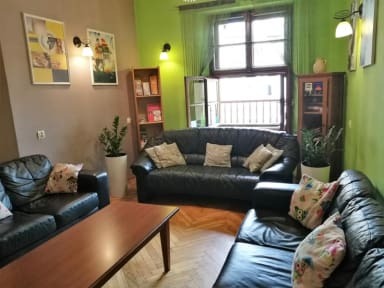 Our hostel is located at Bracka street, inside a medieval tenement house, right next to a number of pubs, clubs, bars, restaurants, shops, historical sites, museums, theatres and universities, 50m away from the Old Market Square, 1000m from the Wawel castle, 1000m from the Railway Station. INTRO hostel is cheap and comfortable, full of relaxed atmosphere. You can spend your time in the living room, watching TV, listening to music, chatting with old friends or meeting new ones, play the guitar, have a beer or simply lay down and have some rest on a comfy sofa. If you like INTRO hostel, you're welcome to visit both of our Cinnamon hostels: in Wrocław and Poznan – and you'll get a discount! We're constantly doing our best to upgrade the quality of service and comfort of our rooms. Our staff's priority is to do anything you need to make your stay live up to your expectations. All the rooms have shared bathrooms. We've got one double room, a 10-bed dorm, two 6-bed dorms and two 12-bed dorms. Every bed has its seperate locker. At the 24h reception, you can purchase soft drinks or toiletries and borrow a towel. As our guest, you get bed linen, soap, tea and coffee for free. Of course, you can use the Wi-Fi connection. Our kitchen is fully equipped and you can use it any time you want. If you prefer eating out, there are lots of recommended places in a nearby, such as: Koko (110m), Raw Organic (50m), Subway (6m), Cup Cake (5m) and hunders of others. Our staff consists of people who travel themselves, so they know how to make your stay perfect. They willingly recommend the most interesting places, help with organizing trips (e.g. Wielczka Salt Mine or Auschwitz) or transport to and from the Kraków Balice Airport. They organize events and keep the hostel clean. Helpful and open-minded, they'll find a way solve any problem, just ask them! Staying with us will make you fall in love with Kraków, meet plenty of interesting people from all over the world and you'll definitely want to come back here at least one more time. Skvela lokace hostelu, snidane v cene, stolni fotbalek a mili zamestanci! Jedine, co bylo trosku spatne je to, ze trouba vyhazuje pojistky.